Address: Avenida François Mitterand, 102, Encamp, Andorra. Hotel Arbre De Neu is situated in Encamp, next to the Funicamp Cable Car. This hotel is just 50 metres from the nearest ski slopes, and offers free Wi-Fi. Its bedrooms are comfortable and feature attractive décor with wooden flooring. 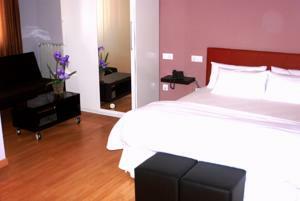 All rooms have flat-screen TV’s with satellite channels and a hairdryer in the bathroom. The hotel restaurant serves a daily, buffet breakfast. There is also a snack-bar on site. Hotel Arbre De Neu is ideally located for skiing and offers ski storage, equipment hire and sells ski passes. It is 50 metres from Funicamp which forms part of the Gran Valira slopes. The Caldea Spa is approximately 5 km away.